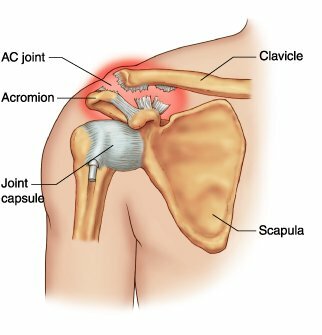 Acromioclavicular joint is a joint between the clavicle and the scapula. Acromion is a continuation of the scapular spine and hooks over anteriorly. It articulate with the clavicle (collar bone ) to form the acromioclavicular joint. The most common problems are arthritis, fracture and separation. Arthritis is characterized by a loss of joint’s cartilage. Arthritis of acromioclavicular joint is common with weight lifter, especially with bench press and a little less with shoulder press. When there is a problem with the rotator cuff, it’s possible that there is also acromioclavicular joint’s arthritis. When there is an acromioclavicular joint separation, it means that the ligament that connects the acromion and clavicle is damaged and that the 2 structures don’t align properly. Separation’s state can be weak or severe, that is why there is a system of « grade » according to which ligament is torn and the severity of the tear. Grade I Injury – This is the weakest damage and the acromioclavicular joint is still aligned. Grade II Injury – This is an average damage. Ligaments are only stretched but not fully torn. In case of stress (physical effort), the acromioclavicular joint becomes painful and unstable. Grade III Inury – This is a serious damage. Ligaments are completely torn and the collar bone is no longer attached to the scapula, which creates a visible deformity. If the rest, ice, medications and change of the training program (changing the exercises) don’t work, the next step is a shot of cortisone. A shot of cortisone in the joint may have calmed the pain and may be permanently swollen. As each individual is unique, the effects may vary and it’s possible that it doesn’t swell permanently. If non-surgical methods fail, it’s possible to perform a surgical operation. The pain is localized at the bones end that make contact with each other and the goal of the operation is to remove some of the end of the clavicle. This ambulatory surgery can be done with a small incision of 1 inch (2.5 cm) long or with the arthroscopy technique with 2-3 incisions. The results and recovery of these 2 surgical techniques are about the same. Most patients have a full movement by 6 weeks and can return to do sport by 12 weeks. Separation can create very painful injuries, so the first thing to do is to decrease the pain. Hold the arm in a sling, put ice and pack the shoulder for 20-30 minutes every 2 hours as needed. Acetaminophen and non-steroidal anti-inflammatory medications can also help calm the pain. When the pain begins to subside, it’s important to move the fingers, wrists and elbow (and eventually the shoulders) in order to avoid having stiff or « frozen » shoulder. The length of time needed to regain complete movement and function depends on the severity or injury’s grade. Recovery from Grade I acromioclavicular separation usually takes 10-14 days while Grade III takes 6-8 weeks. Grade I and II separations require very rarely surgery. With a Grade III injury, after surgery, it’s possible to have full body physical activity with some restrictions.